Rurrenabaque is a town with river and mountain, where starts the amazon basin of Bolivia that is located at the boarder of the department of Beni with the department of La Paz by river Beni. You can access from the city of La Paz in an hour by air or in 18 hours by bus. We have tropical and pleasant climate all the year. 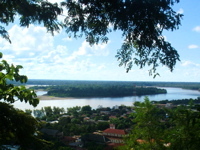 The town is growing as a touristic place for the jungle and pampas where you can see a diversity of fauna and flora. Originally the tribes called Tsimane, Moseten, Tacana y Esse-ejja had lived dispersedly en the area with the nature. However, years ago a number of national immigrants from highland arrived at the area looking for land and rich nature, and today there are more communities of those immigrants than those of the original tribes. Moreover, since when the area has been reserved as Madidi National Park and Pilon Lajas Biosphere Reserve, many tourists have begun to come, and shamefully, the native must have look for other places more inside of the forest to live peacefully. However, today there are many activities to value and conserve the culture and life of the native. The activities of handicraft-making with natural materials from the area are one of the way of conservation of their culture, life and environment for the habitants.